Meguiars Leather Cleaner & Conditioner Pamper and protect your leather with gentle, safe cleaners and rich, luxurious moisturizers. This unique formula with Aloe helps protect leather from spills and stains. UV inhibitors help prevent premature fading, aging and cracking of leather surfaces. Meguiars Leather Cleaner & Conditioner is a quick luxurious, pH balanced one-step treatment safely cleans and protects fine leather without using harmful or harsh solvents. Mild cleaners provide a safe cleaning action without stripping nutrients or protection. Special oils moisturize and condition leather so it remains rich and supple without adding artificial slickness. Premium one step product formulated to clean and protect automotive leather upholstery. Formulated to block the sun harmful ultra voilet rays and prevent fading,drying and cracking of leather surfaces. Use a clean microfiber applicator pad to wipe on a small amount rub gently. Let sit for a moment and then buff with a soft, clean All Purpose microfiber cloth. Perform this step regularly to maintain healthy, soft leather. 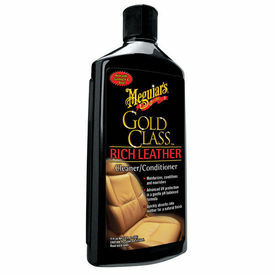 MEGUIAR’S INTRODUCES NEW GOLD CLASS RICH LEATHER CLEANER/CONDITIONER New Formula Cleans, Conditions and Protects Fine Leather Meguiars Leather Cleaner & Conditioner Pamper and protect your leather with gentle, safe cleaners and rich, luxurious moisturizers. This unique formula with Aloe helps protect leather from spills and stains. UV inhibitors help prevent premature fading, aging and cracking of leather surfaces. Meguiars Leather Cleaner & Conditioner is a quick luxurious, pH balanced one-step treatment safely cleans and protects fine leather without using harmful or harsh solvents. Mild cleaners provide a safe cleaning action without stripping nutrients or protection. Special oils moisturize and condition leather so it remains rich and supple without adding artificial slickness. Product Benefits: Premium one step product formulated to clean and protect automotive leather upholstery. Formulated to block the sun harmful ultra voilet rays and prevent fading,drying and cracking of leather surfaces. Retores the natural luster and softness to leather upholstery For Interior Use Pack Size: 414ml Directions for use Use a clean microfiber applicator pad to wipe on a small amount rub gently. Let sit for a moment and then buff with a soft, clean All Purpose microfiber cloth. Perform this step regularly to maintain healthy, soft leather.